Pulsar PSR B1919+21(LGM-1) ("Little Green Men 1"), the first pulsar signal to be recognised. 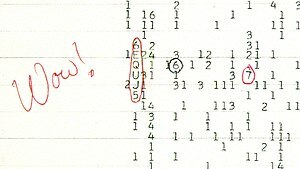 Quasar CTA-102, which was believed by Dr. Nikolai S. Kardashev to have an extraterrestrial signal encoded in it before further examination showed it to be a quasar, the first widely reported work of SETI activity. ↑ Ehman, Jerry. "Explanation of the Code "6EQUJ5" On the Wow! Computer Printout". สืบค้นเมื่อ 2010-01-01. ↑ Gray, Robert; Kevin Marvel (2001). "A VLA Search for the Ohio State 'Wow'" (PDF). The Astrophysical Journal. 546 (2): 1171–1177. Bibcode:2001ApJ...546.1171G. doi:10.1086/318272. Dunning, Brian (December 25, 2012). "Was the Wow! Signal Alien?". Skeptoid.com. สืบค้นเมื่อ 2013-07-01. Ehman, Jerry R. (May 28, 2010). "The Big Ear Wow! Signal (30th Anniversary Report)". North American AstroPhysical Observatory. สืบค้นเมื่อ 2013-07-01. หน้านี้แก้ไขล่าสุดเมื่อวันที่ 8 กรกฎาคม 2559 เวลา 09:02 น.